Do you need crochet tips to get better at your craft this year? If so, you’re in the right place! I’m on a mission in 2019 to provide you with as many crochet tips as possible to help you improve your skills this year. I have learned many of these lessons the hard way – if only I had seen this short list of mandatory crochet tips in the early days! In today’s episode I will run you through five of my top crochet tips that will help improve your skills and see results fast. These 5 crochet tips address areas of tension and overall shape; two chronic issues that need some attention! This episode was brought to you by Red Heart Yarns Loop-It – If you’re looking for something a little different, give Loop-It yarn a try. 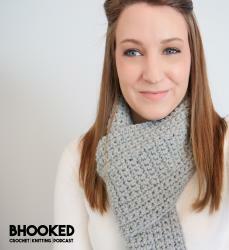 Loop-It is a fun new kind of yarn that doesn’t require a hook or needle! Just use your fingers to pull the loops through one another and watch the fabric appear. It’s great for kids and anyone who loves the look of knitting. Use it to make blankets, scarves, pillows and even sweaters. There’s no limit to what you can create with Loop-It. See all the different color options and plan your next project with Loop-It yarn today. My biggest challenge with both crochet and knitting is finishing projects. I get too excited to start new things, and the old ones get relegated to the UFO pile! It’s hard to find the motivation to go back to them.